eZee offers a complete range of software solutions that addresses every requirement of the hospitality industry. Each solution from eZee has been developed keeping in mind the complexity and inter-connectivity of various functions in the hospitality. We believe the focal point of every software solution should be the simplification and streamlining of your business processes to help you devote quality time to core issues of business growth and customer delight. Its easy to use features and simple Graphical User Interface ensure learning and adapting the solution is effortless. Whether you are an individual boutique hotel or a multi chain property, eZee FrontDesk is perfectly equipped to meet every specific requirement. eZee Absolute is a cloud based SaaS enabled B2B Property Management application that enables small to mid-sized hotels and hotel groups to efficiently manage the sales and guest interaction processes. It combines traditional property management systems (PMS), central reservation systems (CRS), channel management, and internet booking engines into a single unified application. eZee Absolute is a highly scalable option as it has a huge number of interfaces to third party solutions via the Financial Accounting Systems, Key card lock interfaces, credit card processors, call accounting systems and Point of Sales. It is an ideal solution for hotel management companies as well as independent hotels, motels, resorts, inns and Bed & Breakfast. eZee BurrP! is a point-of-sale system ideal for restaurants, bars, night clubs, fast food restaurants, and more. Regardless of the type of restaurant, a single store or a nationwide chain, eZee BurrP! will help usher a new level of efficiency in the business process. The software also offers many modules for table reservation, stock, and material management. 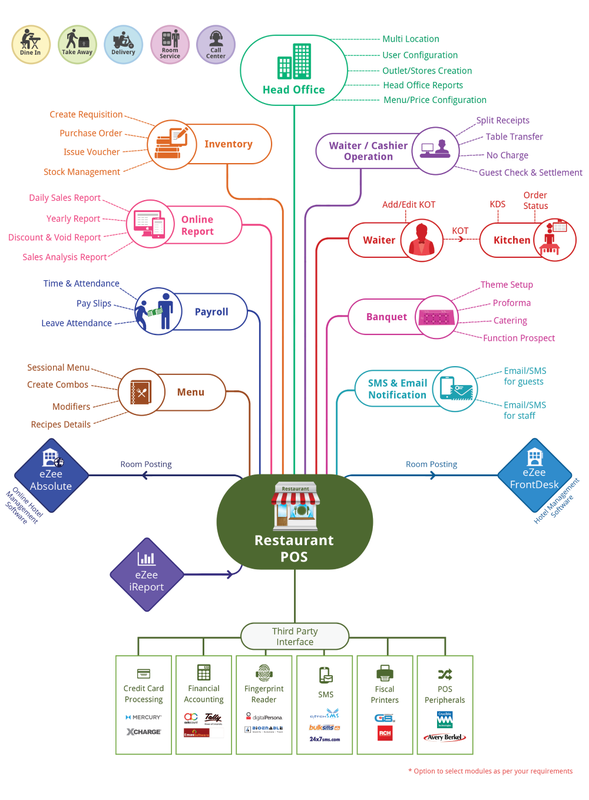 A kitchen display system for new orders, and allows restaurant managers to handle loyalty programs, promotions and gift vouchers, payroll, and a lot more with integration of PDA / Handheld devices for taking orders. The web-based reporting feature helps anyone keep track of all reports. Operations Modes - Dine in, Delivery, etc. eZee Optimus is an online restaurant point-of-sale system, best fit for varied F&B establishments like cafes, bars, bistros, restaurants and even small eateries. The system helps restaurateurs in efficiently handling their daily operations by automating and simplifying them to a large extent. Accessible at anytime, from any device and location; the online POS’s lightweight UI and smooth navigation quickens even the most complex operations of a restaurant. Interfaced with cloud PMS eZee Absolute, eZee Optimus will take your restaurant to the next level through feature-rich and adaptive functioning. eZee Reservation is an Online Booking Engine which integrates seamlessly with the property website, enabling clients to book reservations, packages, and offers directly from the website. It lets you setup your entire property details through single dashboard while giving you direct access to key areas of functions of your property. With eZee, you can increase your global reach by providing your clients with all the features and booking experience associated with the efficiency of an OTA. eZee Centrix is a Channel Manager that helps hotels to easily manage property rates and inventory on various channels/travel websites. It automatically updates all the changes made on client's end to all the channels instantaneously. eZee Centrix can be accessed from anywhere, at anytime through smart phones/tablets to keep you updated without any hassles, no matter where you are. The Channel Manager ensures that your rooms are distributed globally by making your property connect to Global Distribution System (GDS) consisting of Amadeus, Sabre, Galileo and Worldspan. In addition to GDS, we have a comprehensive list of channel partners with whom eZee Centrix is currently compatible with and new channels are added on a regular basis. In today's highly competitive market, global exposure is essential and eZee Centrix is just the right tool to attract new clientele. The next generation solution for restaurant management, eZee iMenu is a sleek and stylish way to present your menu items to your customers and providing them with a new interactive experience. User-friendly interface offers a smooth navigation of the digital restaurant menu and ordering blazing fast. It will improve the customer service, efficiency and increase your revenue generation capability of the business. You can download iMenu today directly from Google Play Store or Apple App Store. eZee iFeedback is a versatile online feedback system for hotels and restaurants which allows to build stronger relationships with guests and customers, giving you complete freedom on how and when to collect feedback from guests. Powered with robust features, eZee iFeedback will give hotels and restaurants utmost liberty when engaging customers. Customer feedback is of the vital importance for a business to be successful and they are the heart of every successful business. In the hospitality industry without satisfied and happy customers, it would be impossible for hotels and restaurants to be successful and constantly grow. eZee iFeedback will adapt naturally with hotel and restaurant operations, enhance overall customer service, and provide a strong community for future success. Appytect allows hoteliers to get their Hotel App on Google Play Store and Apple App Store. Attract clients to all the amenities and services offered by your hotel through your hotel application. Robust customization options will highlight hotel's brand and provide convenience in promoting hotel facilities and services such as nearby attractions and destinations. A dedicated mobile app for your hotel can do wonders for your guests and hotel's overall brand image. Combining mobile booking engine and in built booking engine, It gives guest new way to book directly with the hotel and provide their feedback right from their smart phones. AscentSoft © 2017 Ascent Software Development W.L.L.